THPBlog: Jackson State Forest to log on steep and unstable slopes near Parlin Creek. Jackson State Forest to log on steep and unstable slopes near Parlin Creek. This THP is about 10 miles SE of Fort Bragg, CA near Highway 20 at an elevation of 250 to 1300 feet. Jackson State Forest is planning a tractor and cable logging operation on steep and unstable slopes in redwood, Douglas fir, grand fir, Sitka spruce and coastal hemlock forests. 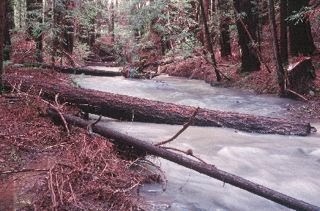 The THP area drains into the South Fork of the Noyo River which is listed as impaired for sediment and contains coho, steelhead and chinook salmon. There are erosive sandstone and mudstone soils present, and 7 landslide terrain sites including debris slides, rockslides, debris flows and a steep head wall swale. Western tailed frogs were reported near unit G, and steelhead have been seen near units G and K. There is a marbled murrelet stand adjacent to a haul road, and 2 populations of Humboldt milk vetch were located along roads. This THP will REMOVE: 147.6 acres of nesting/roosting habitat within .7mi for the Parlin Trib owl site, 12.9 acres of nesting/roosting habitat within .7mi for the MEN639 owl site, 37.9 acres of nesting/roosting habitat within .7mi for the MEN582 owl site, and 152 acres of nesting/roosting habitat within .7mi for the MEN550 owl site. More information is available on the THP Tracking Center website.